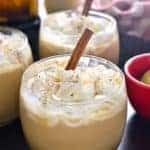 Eggnog Mudslides are a delicious holiday twist on a classic cocktail! The perfect addition to all your holiday celebrations! Combine kahlua, vodka, and eggnog in a cocktail shaker with ice. Shake well, then strain into glasses. Top with whipped cream and ground nutmeg.